Planning your wedding can be one of the most exciting times of your life, and the most daunting. So what if you're planning a wedding and you're pregnant? Lots of women decide to scale back their big day when they are expecting, but this doesn't have to be the case. Whether you're dreaming of a timeless and classy wedding day or a contemporary DIY do, being pregnant doesn't mean that you need to compromise on style. We've put together a list of pinterest-worthy 2018 wedding trends that you can still get excited about while pregnant, from body-skimming silhouettes and boho capes to naked cakes and flower crowns. Clean lines... While 2017 was the year of boho bridal gowns, 2018 will see a resurgence in crisp fabrics and body-skimming silhouettes. Perfect if you are pregnant as heavy drape and clean lines smooth your pregnancy curves, creating a flattering silhouette no matter how far along you are. The Tiffany Rose Eleanor Gown is elegantly simple, with refined detailing on the shoulders, a perfectly tailored bodice in leavers lace and a full length draping skirt - statuesque, majestic, romantic. Rich textures... Make a statement with 3D fabric effects and textured laces – think vintage glamour with a contemporary twist. Less formal than traditional delicate French lace, this look is perfect if you're looking for a show-stopping dress without frills and fuss. The sheer floral lace of the Tiffany Rose Asha Dress has a subtle sheen and captures romantic glimmers of light perfectly, all double lined in premium British jersey for an impeccable fit from the ceremony to the fireworks. Sheer tulle and detailed backs... There's just something about sheer fabrics and detailed backs which breathes romance. If clean lines and tailoring aren't your style, the floaty fabric and femininity of sheer tulle is edgy but elegant. Sheer sleeves and necklines allow you to cover-up but still show a little skin. The sheer polka dot tulle fabric we've selected for our Silvia full-length maternity wedding gown adds fun and romance to this striking dress. Tied at the waist with a smooth satin sash to make the most of your gorgeous new-found curves. Capes and Coverups. A trend straight from the catwalk, capes can add a stylish finishing touch to your wedding day attire. If you're planning a winter wedding a feather cape is ideal for any bride wanting to make a statement. For cooler summer evenings here in the UK or brides who are planning a more traditional church wedding, lace capes offer sheer coverage without compromising on style. The Tiffany Rose Boho Lace Bridal Capelet adds an exquisite finishing touch to your wedding day attire. Made from beautiful sheer Guipure Lace, intricately detailed with a floral and leaf design to blend harmoniously with your chosen wedding dress style. Easy to wear with a straight neckline, the longer V shape back looks striking during the ceremony from behind. Mix and Match... Finding a style and colour that all of your bridesmaids agree on can be a challenge - mismatching dresses gives all of your bridesmaids the chance to wear a style they look and feel amazing wearing. If you're dreaming of a boho-inspired wedding why not add florals to the mix. Flower crowns and wildflowers in the hair will be in style for a while, especially for summer weddings but floral bridesmaid dresses are the next big trend for 2018. For total romance our Maya Gown oozes femininity in the prettiest dusky watercolour florals with icy blue lining and a sash to match, creating a romantic Grecian silhouette for any blossoming bridesmaid. Sequins and sparkle... No longer reserved for festive nuptials, gold and pink tones add warmth to any wedding colour palette, whatever the season. The Tiffany Rose Mia Dress, available in both short and long, has a subtle sequinned bodice and full shimmering skirt in divine creamy taupe tones. Finished with flattering capped sleeves and a sheer neckline for that extra added special magic - your bridesmaids will adore you! Fresh and glowy skin... The ‘less is more' mantra has never been so true in the beauty world. With celebrities opting for the no-makeup makeup looks on the red-carpet, many brides are following suit. Fresh glowy skin and subtle pops of colour create a youthful look. Undone hair... Effortless up-dos and boho braids will be the go-to hairstyle for any bride-to-be 2018. 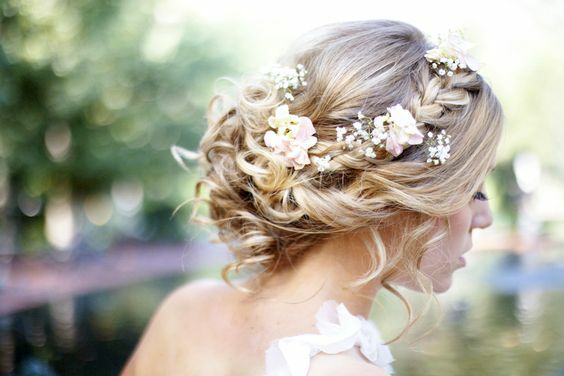 Worn as a flower crown or woven into plaits and braids, fresh flowers add an enchanting and romantic look to any wedding. You can't plan a wedding without a Pinterest board…or ten. So, we've put together a selection of our favourite 2018 bridal trends, from floral arches and naked cakes to quirky venues and pimp your own (non-alcoholic, of course) prosecco bars. Discover our top Pinterest picks, here. Enjoy this? Read our blog post where we share the 10 things you need to know when planning a wedding while pregnant, here.